Hunkered down here on high ground in Delran watching the 20 lbs. of grass seed that I put down in my backyard a few days ago wash down the street, I thought I’d take my mind off dire forecasts of flooding and power outages by catching up on some HSR website correspondence. Brace yourselves for Irene. I sure remember, most vividly still today, a hurricane that hit South Jersey and headed up and did substantial damage in New England back in the mid-fifties time frame. The wind was incessant as I recall. Most harrowing for a child or adult to experience. Good luck. 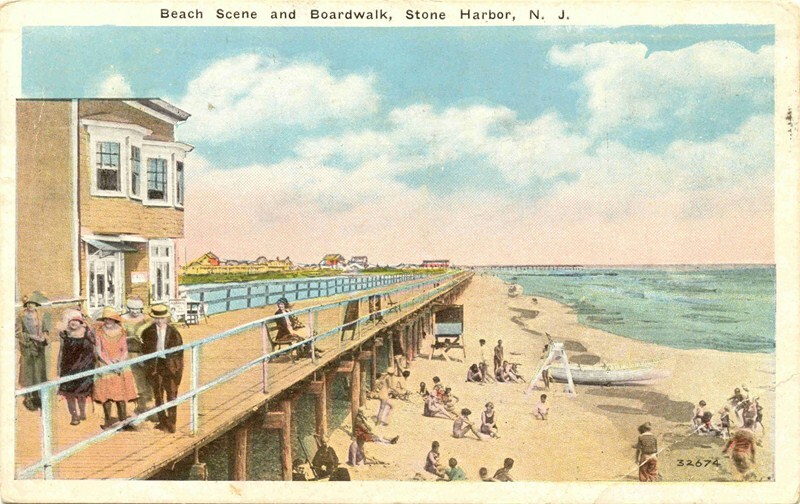 As for Stone Harbor’s boardwalk, it was dedicated in 1916 and lasted slightly less than 30 years. Sadly, all of the boardwalk washed away in the terrible storm of 1944. Always happy to provide information relative to these super postcard time- capsules. My aunt and uncle had a place on LBI and we took a drive down to view the aftermath of that 1950s hurricane. That’s when “the bay met the ocean” and water cut the island in two. We saw so many cottages and homes destroyed. Was it Hurricane Hazel, Readers?? OMG! (as these young folks say). Comcast just interrupted the TV cable feed for a Burlington County tornado warning. I have the most wonderful childhood memories of staying at the Baldwin Hotel. 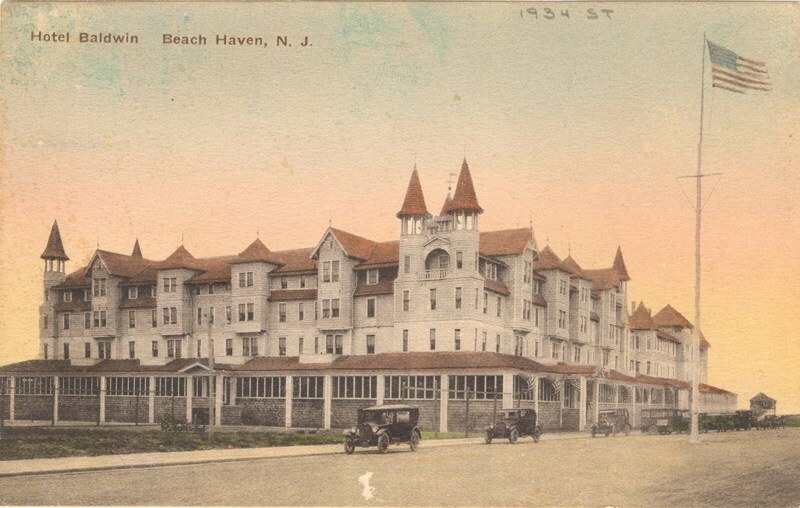 Our family spent a couple weeks each summer at Beach Haven, staying at the Baldwin. As a child this spectacular building provided exceptional exploring opportunities. My dad was a watercolorist who painted a wonderful painting of an adjacent property, where nuns spent summer vacations. He did so while sitting on the balcony of our room. When the Baldwin burnt to the ground, Beach Haven lost a large part of its identity. Thank you for posting this beautiful rendition of the grand old Baldwin. It’s my pleasure to bring these pictures and information to you. What have you found in these pages that has struck a chord for you? We have lots more room to post any images or recollections you have to share.